Autoscript’s new Intelligent Prompting mounting system and carbon fibre hood have been meticulously designed to ensure maximum stability and rigidity, and minimum weight. This reduces payload issues for the camera support, problems with excess movement at the end of transitions and oscillations at the end of robotic movements, making Intelligent Prompting systems the most flexible teleprompter option on the market. Engineered with a ‘fewer parts and fewer processes’ philosophy, the rail based system also achieves rapid assembly with quick release mechanisms for both the camera and monitor. The unique mounting solution offers greater rigidity with better cable management, and without the need for any counterweights in almost all camera/lens configurations, saving significant weight and cost. A rail support offers high stiffness and simple adjustment, with an integrated Touch & Go plate to attach the prompt monitor. A separate camera carriage travels along the rail to match the length of the camera/lens setup. The carriage houses the monitor’s external PSU to improve weight distribution and includes an integrated Touch & Go quick release mechanism for rapid attachment/detachment of cameras. The low profile hood design utilises carbon fibre for unmatched stability and lighter weight. 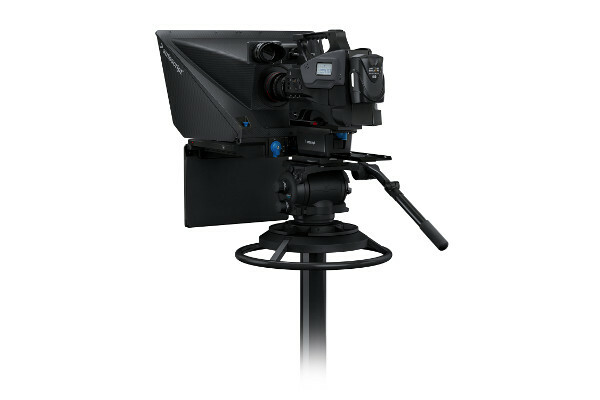 Folding side panels allow light to the prompter display to be minimised in any environment and with any monitor size. The panels can be folded completely to protect the beamsplitter glass and allow it to remain in place when the hood is folded shut for transportation. The hood is directly mounted to the prompt monitor back plate. The complete monitor, hood and mounting assembly has been designed using extensive geometric modelling to ensure that all ENG system cameras and camcorders, and compact system camera setups can be accommodated with the minimal number of parts, and the field of view of all ENG lenses down to a focal length of 4.3mm will not be impeded. This design vastly improves setup time and reduces the size of the lens opening at the back of the hood. The lens is sealed using a flexible ring, giving greatly improved access for direct control via hand grip, or for connection of pan bar mounted z/f demands.